Dense and very dark purple with excellent color consistency across. Fresh strawberry, pipe tobacco, allspice, bramble, and pecan. Leather, plum compote, wild blackberry, rhubarb, and holiday spices. Well balanced, with a rich and satisfying mouthfeel, this versatile wine will shapeshift to match the occasion. It doesn't get any better than Zin and our Honey Hickory Chicken Thighs! This wine is expected to sell out. You've been warned. At sight, it’s dense and very dark purple with excellent color consistency across. There’s fantastic notes of fresh strawberry, pipe tobacco, allspice, bramble, and pecan, with all the diversity you’d expect from a blend. On the palate, there are notes of leather, plum compote, wild blackberry, rhubarb, and holiday spices. Well balanced, with a rich and satisfying mouthfeel, this versatile wine will shapeshift to match the occasion. You couldn’t go wrong with a hearty glass of this Ravenswood blend and a heaping bowl of linguine with a meaty bolognese sauce. Agent Red once asked Joel Peterson (Ravenswood's prolific winemaker) what his winemaking philosophy was. His answer: "Wines should reflect the flavors of the places that they were grown. Wine should taste like fruit, not oak. Wine should be balanced, rich and complex and interesting. The best wines are the ones that develop well with age." "To that end we attempt to let each vineyard express its optimal character by using winemaking techniques and careful attention to detail that dwells on each vineyards particular strengths. Our mantra is "no wimpy wines", meaning that we want each wine we have to exhibit strength of character, not merely power." Thanks, Joel. We love you. The 2013 Pickberry displays aromas of cherry, plum and currant, cigar box and leather. A wonderfully balanced wine with a lingering finish. Not long after Cris and Lorna graduated, they got married, moved to San Francisco, and had a couple of kids. In Haight-Ashbury, where they first lived, it was the Summer of Love. But all Cris and Lorna knew was that they hated the fog that blew in from the Pacific Ocean each day. Exploring north of the Golden Gate for a sunnier spot, they found a place on the north side of Sonoma Mountain and began spending weekends there in a trailer, building a cabin and picking blackberries. Before long, their two toddlers started calling it “the pick berry place.” Since Cris was a home winemaker, they decided to plant Chardonnay grapes and, because Cris had a weakness for Bordeaux, they planted Cabernet Sauvignon and Merlot also. When the vines started producing, Cris and Lorna got a call from a local vintner, Joel Peterson, who knew that good Cabernet came from the north side of Sonoma Mountain. 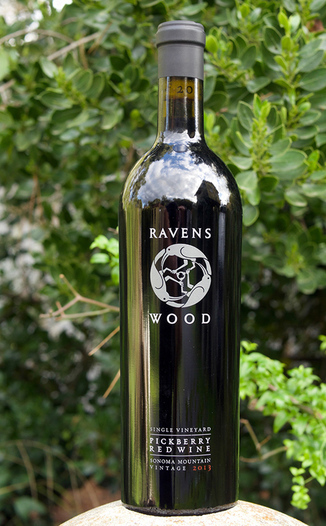 Ravenswood’s first “Pickberry” wine was called “one of the most important wines of the vintage” by Wilfred Wong and received a 90+ rating from Robert M. Parker Jr. Pickberry has become one of Ravenswood’s most prestigious wines.